Are you developing motivated, self-directed learners? Each year, a national not-for-profit UK company, Campaign for Learning, runs Learning at Work Week, which sees organisations of all sizes roll out creative and innovative events that inspire and promote a culture of learning. A different theme is given to the event each time it runs so that organisations can develop engaging ways to focus on a different area of training. This year, Learning at Work Week (running from 15-21 May) is ‘Curious and Creative’ – a message that Julia Wright – the company’s national director – says promotes the idea that curiosity is a good thing and often a starting point for learning. “If we are trying to develop motivated and self-directed learners, then enabling people to ask questions and be curious is important,” she told L&D Professional. A 2016 study suggests that a strong sense of curiosity in employees can equate to a knack for creative problem-solving. The study – carried out by Oregon State University in the US – indicates that employers looking to hire candidates with creative problem-solving abilities would do well to test for curiosity as a personality trait during the recruitment phase. Wright said this is the start of the process for developing new ways of working and learning, and products and services that ultimately benefits the organisation. Companies taking part in Learning at Work Week this year are bringing the theme to life with some great events including webinars on the case for curiosity, talks by designers on their creative process, and workshops that give people the chance to be creative and make things. So what value does the Learning at Work initiative have for L&D teams across UK organisations? Wright said Learning at Work Week is a great opportunity to get creative, run a branded campaign and promote a culture of learning at work with inspiring events and activities for everyone. “Doing something different around a focused week helps make learning visible and sell the idea that there are many ways to learn at work,” Wright said. 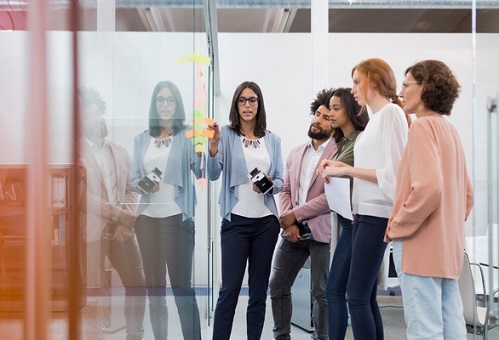 She added that L&D teams use Learning at Work Week in “brilliant ways” to engage colleagues and bring people together to learn from each other. “All sorts of sessions take place, from hands-on workshops, through programme launches to masterclasses and talks. Sharing skills, knowledge and passions between colleagues from all levels is a key feature of the most successful weeks,” she said. Wright added that this is also a powerful way of tapping into collective knowledge and experience throughout workplaces, which builds learning potential and social capital. “We’re at a point where recruiting to address skills gaps will become harder and ‘growing your own’ talent will become increasingly important,” she said. To do this effectively, Wright says organisations need to “dig a bit deeper” and get rich understanding of who are the people in our workplaces so they can develop learning opportunities that engage and inspire. “We often and understandably focus on roles and responsibilities to plan and deliver learning as these are linked to performance,” she said.